What a glorious game of brinkmanship this Kildare versus the GAA battle has turned out to be, with the Lilywhites' round three qualifier against Mayo no closer to being sorted out. In some ways, the GAA themselves would hold a grudging admiration at how attention has been turned away from a sagging Championship - the winning margins in the provincial finals over the weekend being 18, 17 and 12 - and not only onto front page prominence but leading the news bulletins as Kildare insist that Saturday's All-Ireland round three qualifier against Mayo will be played in Newbridge, or nowhere at all - not Croke Park like the GAA want. "The game has been fixed for 7pm in Croke Park, and that is not going to change under any circumstances," said Feargal McGill, the GAA's Director of Games Administration, before going on to explain that the game is subject to health and safety risks. St Conleth's Park has a 9,000 capacity, which would be reduced to 8,300 for an all-ticket event, which is what the Kildare county board are proposing. McGill made the point that if it were any of the other six available teams, then it wouldn't have been an issue. But the 12,000 expected fans travelling from Mayo would create a problem, best explained by Ned Quinn, Chairman of the Central Competitions Control Committee. "The risk would be that people would get involved with other spectators," he said. 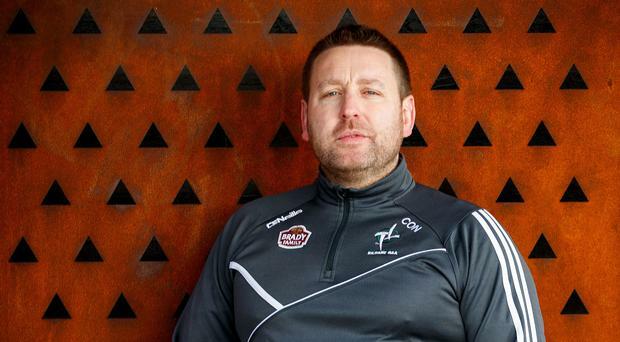 "I wouldn't call it crowd trouble, but there could be animosity shown to people who had tickets and others couldn't get them, claiming they were regular supporters of Kildare." That last line was terrible from Quinn - raising the spectre of crowd trouble before stating that's not what you meant is a cheap trick. Perhaps he might have provided some examples for his suspicions, because crowd trouble before a match is unheard of in the GAA. Quinn will recall 2013, when his native county Kilkenny met Tipperary in a phase two hurling qualifier. That rivalry was at its very peak and could have attracted a crowd of 50,000 to Croke Park. But that possibility wasn't even raised. Instead, it turned out to be one of the greatest atmospheres at a hurling game, the main stand bunged three hours ahead of throw-in as Kilkenny prevailed in front of a crowd of 22,307. Both the GAA and Kildare have painted themselves into their corner and to back down now would appear weak. It's not hard to see the strains of populism in the Kildare argument, but it is being somewhat hijacked. For instance, Sky TV are down to cover a double-header on Saturday and when their production teams and pundits had a debrief after the Mayo-Tipperary game last weekend, they were fully preparing to head to two different venues. The suggestion that Sky have any influence in fixture making is ludicrous, but there are enough people out there prepared to swallow the myth and earn a few more followers on social media by saying that the money from Sky is dictating major decisions within the Association. That's not to say that money is not important to the GAA - moving the game to Croke Park along with Tyrone and Cavan, it is a huge factor of course - but the GAA will be exasperated that it is Kildare - who they bailed out in 2012 with a €300,000 'advance payment' - that feel empowered enough to be the tail wagging the dog. That said, it is impossible not to feel sympathy for Kildare having played two away games in Derry and Longford. The GAA are already bending the rules by allowing Dublin to have two games in the Super 8s without appearing to make the rules up as suits them. And the only rule that matters is Rule 6.28(A) (v) (2), which states: "Home venues SHALL be used in Rounds 1, 2 and 3 of the All-Ireland Qualifier Series, with first team drawn having home advantage", with the only exception being: "Venues for Round 4 shall be determined by the CCCC." It was also suggested that this rule may be examined over the autumn by the GAA, and it would take a brave man to predict that this won't crop up in Frank Murphy's annual housekeeping duties at Congress. Kildare, besieged and maligned with a winless league campaign and a humiliating defeat in Leinster to Carlow, are the big winners right now. And there is no bigger winner in all of this than manager Cian O'Neill. A few days ago, it looked like he was getting ready to clear his desk. Now he is a ready-made folk hero in the county. Funny what a bit of conflict can do.